Yesterday a king was born. He was born to a royal line. A prince and princess rejoiced at his birth. A queen must approve of his name before it is announced. He is one of three kings waiting. Outside the modern hospital, in which he was born, throngs of people cheered at the announcement of his birth. The media sent word of his arrival throughout the world. And people, sitting in their living rooms or bars or airports or doctors' offices, glued their eyes to the television for the latest word. He will go home to a palace, if not today or tomorrow, eventually. He will be raised with a silver spoon in his mouth, his pinky firmly planted against the side of his tea cup, and a pony in the royal stables. He will have a nanny and maids and tutors and butlers and chefs and chauffeurs. The future king will learn proper protocol. He will bow at the appropriate time, shake hands, look people in the eyes, send thank you notes on royal stationery, and meet heads of state. He will play polo and rugby and soccer and golf. He will go on holiday to exotic places or in the countryside. Eventually, three kings down the line, this new king will sit on a throne. He will address parliament and set the tone for his vast kingdom. The royal gentleman will entertain lords and ladies, dukes and duchesses, and squires. And as the peasants line the streets to get a glimpse of him walking by, he'll stop and chat with them, shaking a few hands, gratefully receiving the flowers they offer him, but then returning to his Rolls or carriage to be whisked away. A king was born yesterday. Another king, a different king, was born many, many years ago. But things were different then. This king was also born to a royal line, but by the time he entered the world his people had forgotten that they were the king's family. They were oppressed and downtrodden, long removed from the palace. This king was born, not in a fine hospital, but in a stable, more than likely nothing more than a rough cave. His parents had hastily married following the announcement of his pending arrival. They were young and unprepared, perhaps even abandoned by those they had previously depended upon. 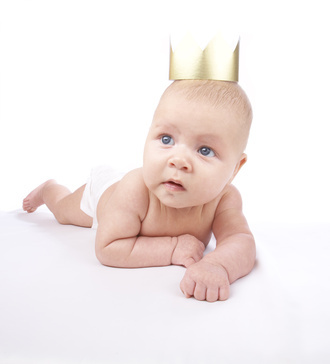 No one attended this king's birth except his young parents and a few smelly animals. And once he was born, they undoubtedly stayed close, uncertain as to what to do next. Surely they were a little taken aback when a group of scraggly shepherds appeared and poked their heads into their humble hovel. Undoubtedly these uneducated men tried to herald the birth of this young prince throughout the land like our modern day media, but who would listen to men holding staffs rather than microphones? As the king grew up, no one knew he was royalty, and they treated him more like a peasant than a prince. He grew in wisdom and stature, and people liked him. Even though he was not lauded as a royal, he was certainly held in favor; he was kind and gentle and loving. As a young man he worked alongside his dad, building furniture and farming tools in his carpentry shop. There was no silver spoon, no pony, no nanny, no chauffeur. And when he went out into the world no one bowed or curtsied. Crowds did not line the street to hand him posies or shake his hand. He did not entertain dignitaries or address parliament. Instead he chose to share meals with harlots and crooked tax collectors and the infirmed. He walked the dusty roads with open sandals on his feet, and befriended an odd group of "blue collared" fellows who walked along with him. But because he chose such a different path from most kings in waiting, the people misunderstood his good and gracious heart. They assumed he was filled with vain and wicked motives. They accused him of insurrection and blasphemy and rebellion. He was guilty of none of those. One day the people, who still did not recognize their king, insisted he be killed. Regardless, one day every knee will bow and every tongue will proclaim that this king, born over 2,000 years ago in a crude stable, is indeed king of all kings and lord of all lords. 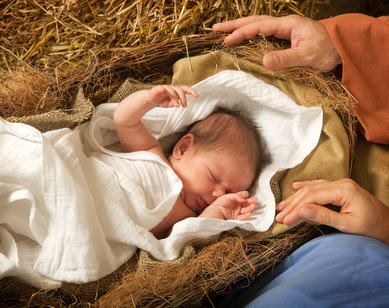 While so many in the world are so caught up in the birth of this tiny baby who will reside in a palace, why not turn your attention today to the true King, Jesus? He is worthy of our adoration and devotion like no other. Instead of sitting glued to the telly today, let's spend time in the chronicles of our true King, the Bible. And there we will find the true Story of the King who will reign with truth and grace forever and ever, the King who paid the ultimate price of chivalry for you and me, the King who reigns today in heaven and who desires to reign in your heart. To which king will you pay homage today?